I asked, "What is the most important thing you ever learned from your sensei. Each of my teachers taught me many things but as soon as you ask what was the most important, most have to think about it. Since most may have studied with several different sensei, what do you think was the most important thing and how did it change your life or skills?" When I asked the above question I first thought only about my martial arts teachers but then I thought about those that made a strong influence on my life and thought about all my teachers and instructors. Raised in Alaska in a home without indoor pluming until I was a teenager along with twenty-four years in the Marines learning skills for war have honed me for a Spartan life. >From my Father, Gaspar Advincula, one of Alaska’s best photographers, taught me to believe in what you do and be the best of what you do. He said what ever you do, try to be the best at something. At age eight, he had two of his Filipino friends teach me martial arts. My father started me on the right tract and to this day I try to be the best in what ever I do. Pete Rado my first Escrima and Combat Judo instructor, taught me how to fight at a very young age. He gave me confidence. On one occasion I tried to throw him and he went over. At the time I thought I did it myself but now believe he let me do it. The next day at school, several bullies tried to bully me and I chased them all away. It was Pete Rado who taught me confidence which I still have today. 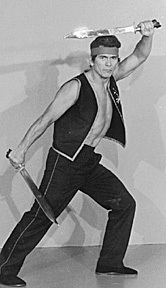 Tony Navaro K-bar knife, taught me how to use my imagination in fighting. He taught me how to use a K-bar (Fighting Utility knife) which he called the alphabet system. He used letters of the alphabet and told me to combined them in any sequence. Letters could be large or short caps, upside down, sideways or diagonal. Use your imagination he said, make any combination of the letters your imagination tells you. It was Tony Navaro who taught me how to combine letters (anything associated) by using my imagination. Just like of kihon, kotekitai, ki, kiai, kata, and kumite. So Navaro taught me to use my imagination. >From my USMC Boot Camp Drill instructors at San Diego, CA (1957): I learned If you say you can’t you are right. If you say you can, you are probably right. When I first came into Marine Corps Boot Camp, I thought I could not do a lot of things but with loving tender care, my Drill Instructors soon changed the way I thought. I was once given a toothbrush and told to clean the “Head” (Navy term for Latrine) and I looked at the tiny toothbrush and said I can’t, because the toothbrush was too small. My three Friendly Drill Instructors instantly and without the slightest hesitation motivated me with kind words and I was quickly convinced that with a lot of effort on my part I could. I now understand why they call it BOOT Camp. When I graduated from Boot Camp, I was convinced into believing I was the best fighting machine in the world and knew without a doubt, you make it work no matter what you are doing, and with what ever tools you had on hand! Kind of like make it work. From my Marine Corps Primary Marksmanship Instructors (PMI): I learned to shoot for center of mass. If the target moves up, down, left or right, you have a better chance of hitting part of the target. So they taught me better to hit then miss. In other words go for the center of the target and forget about trying to shoot like the Lone Ranger (forget all the little targets or vital points) shooting the gun out of the hand. >From my Infantry Training Regiment Instructors (ITR). 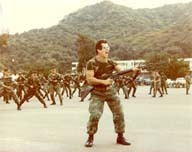 While in formation being inspected, by the NCO Instructors, the Senior NCO Instructor yelled, “Who wants a weekend pass?” Many of us were stunned and looked at each other trying to figure if the Drill Instructor said what he said. I was about to answer when the Marine next to me yelled, “Sir. I do!” The Senior Drill Instructor yelled back, “Then take off. You get the pass.” What I learned was, he who hesitates loses the weekend pass. In other words be aggressive. Even today I still try to be aggressive by acting like I know what I am doing. >From a old Swedish carpenter who was teaching me, when I was a carpenter apprentice, after I was discharged from the Marines on my first tour of duty. He had made a error and had to correct it. He said, “It is not a good carpenter who does not make mistakes, it is a good carpenter that corrects his mistakes. I learned from him that making mistakes is not a sin, not correcting mistakes is. >From Loi Miranda, Largo Mano Escrima. I had already studied escrima from Pete Rado and Tony Navaro when I started to learn from Miranda. He would ask what would you do if I attacked this way and I always had an answer and would demonstrate what I learned from my prior escrima instructors. Miranda stopped teaching and my father admonished me saying I knew too much. My father told me if I knew how to handle Miranda’s attacks, why was I studying from him. My father said just listen, don’t show what you know just play dumb and he will teach you. Now while this was a lesson from my father, Loi Miranda taught that there is more then one style of escrima. We have a blind loyalty for our first instructors thinking they could not be wrong and no one can replace them. I’m not saying my first escrima instructors were wrong, it is just that later, I thought Mirandas was superior. My first escrima instructors taught multiple hits or cuts while Loi Miranda believed in one power stroke or cut to end a fight. I learned from Miranda Largo mano where one strike one kill, and it reinforced my belief in karate’s one strike certain kill. It was here that the light bulb turned on the power of simplicity for Loi Miranda taught five cardinal blows with four strikes and one thrust, with emphasis on the thrust. Today I prefer largo mano techniques when doing escrima. So he taught me to keep it simple. >From my Marine Corps NCO instructors (Cpl-Sgt): I learned to lead by example by setting the example. From my Marine Corps SNCO instructors (SSgt & GySgt) SNCO School: I learned leadership to never ask the troops to do what would not do yourself. What I learned from my TMI (Technique of Military Instruction) instructors. Throughout my 24 Marine Corps career, at many of the military schools I attended, they teach TMI. While they break it down, it all came down to be prepared. The more you knew your subject, the better your presentation because you have confidence in your subject. It is well known that the most feared thing to do is stand before your peers and give a speech or teach a subject. In everyone of my TMI classes I always beat the rest within the class. I have been to a school where both SNCO’s and Officers attended and had no problems. So what I learned from my TMI instructors is be prepared. And that is for anything you do. >From my Drill instructors at Drill Instructor school, Parris Island SC. We had to go through boot camp again and I learned everything over except now they emphasized even more teamwork. They said a Drill instructor must teach his recruits how to be a team and work as a team. We were set up in 14 man squads just like the recruits we we going to have to train if we graduated from Drill Instructors School. The senior GySgt in our squad could not handle the squad, so I was second in command had to take his place and took over as the squad leader. Our squad graduated all 14 of our Marines in the squad while some squads only graduated 3 because of the demanding physical training. It was the first time according to the Drill Instructor school, where all 14 Marines in a squad ever graduated. I learned more heads working as one is better then one head trying to do the work of several. I learned to work as a team. Capt. Dahlberg was my CO while I worked for Marine Corps Safety Office in Parris Island SC. During a Commanding General Inspection, a General came to me and said he did not like the way I wrote up an Safety Report. After the General left, I protested to Capt. Dahlberg that I was doing my job. He asked me who do I work for and I replied, “You Sir.” Capt. Dahlberg asked how were my fitness reports (He makes out a fitness report on me grading my proficiency) and I said outstanding sir, “You always give me outstanding grades). Capt. Dahlberg replied, “Then what's the problem, the General does not grade you). Lesson learned, find out who you work for and do the best job you can for him. Capt. Hardacker was my CO on Okinawa, Camp Pendleton, and RVN. He was the best officer I ever had the privilege to work for. He set the example to follow. He had one lung yet out walked us on long hikes. On one occasion on Okinawa he called me and two others into his office. We asked each other what do you think he called us in for together think we did something wrong. Capt. Hardacker said it was Okinawan New Years and told us all to take the day off and celebrate the Okinawan New Years. The three of us were married to Okinawan women. In 1964 I retuned to the states from Okinawa. Capt. Hardacker was CO at my new unit. He had personally asked for me to come to his unit. In late 1964, Capt. Hardacker called all the all the married personnel in our unit to his office. He said there was a problem going on in Vietnam and that Marines were going to be shipped over there and so he was looking for volunteers. He stated most might still have to go, but since we were married rather have volunteers go first. I was the only one who stepped forward. In RVN, Capt. Hardacker asked me to take his R&R and go to Okinawa stating he was thankful for volunteering to go to RVN and knew I had a wife on Okinawa. I used his R&R. Two weeks after I returned from Okinawa, from R&R, Capt. Hardacker again called me into his office and told me to take a Marine prisoner to Okinawa. Again I got to go back and yes got more time on Okinawa. A few years ago I learned that Capt. Hardacker was lost at sea off the coast of Oceanside, California and presumed dead. Michie knew of him and was just as heartbroken as I was. What I learned from Capt. Hardacker was you reward those who stand above the rest. Shimabuku Tatsuo Isshin-ryu taught me that karate was not only for self defense, but also for health and fitness. 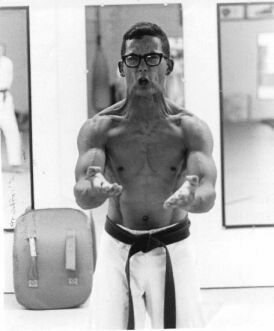 In late 1963 he explained the Kenpo Gokui. He explained “The blood circulating is similar to the moon and sun” as performing sanchin kata, the blood circulating was through the body was like the cycle of the moon and sun and when either ceased to exist and work in harmony, the body dies. Tatsuo stated Sanchin kata was also for health and fitness. It was important to be in the best physical condition not only for fighting, but to help in living a fit and healthy life. A person that was healthy could take care of loved ones. Tatsuo also explained that in Sanchin kata in a fighting situation you always keep a reserve of air and never commit all your air out. He explained that in WW ll, he had horse and cart he used in business and loss them in an attack. He said he put all his money into his horse and cart business and after losing it had nothing to fall back on. He had no money reserve to take care of his family. In 1964 I quit smoking adding a longer and healthier life span . I also started having the Marine Corps paymaster take out part of my pay and put them into US Savings Bonds. In the late 1960’s until I retired from the Marines in 1981, I was in the top 5 percent in physical fitness in all my Marine Corps units I served in. What I learned from Tatsuo is to always keep a reserve and be in the best physical condition you can. A healthy person can work and take care of his family, where someone sick has to be taken care of by his family. The reserve was saving and keeping funds for a rainy day helps in emergencies and retirement. Explaining the Kenpo Gokui and for sure the second code of karate taught me to be responsible for my health and financial well being. Kaneshiro Kang taught me Hindiandi. He showed me a lot of little things, and a lot of little things make big things. Punch, kick or strike from wherever your fist or foot is. All techniques must work no matter what, and to attack with enthusiasm. So I was taught a lot of little things together make a big thing. Kind of like a chain of events in chinkuchi. Nakasone Kinei Goju-ryu was my primary Goju-ryu Sensei. From him I learned that all Okinawan sensei do not know or understand bunkai. I would ask what is the bunkai to a certain move in a kata and he didn’t know saying he would find out from Masanobu Shinjo. He always came back with a answer and on a few occasions would take me to Masanobu’s dojo located in New Koza (Okinawa City) to train or ask quests from Masanobu. Nakasone told me he learned more from me then he taught because I asked the bunkai and he had to learn them from Masanobu. From Nakasone I learned sometimes the teacher does not know, and sometimes the student knows more and if this is so, take advantage and learn. Everyone is better in some things then you, so if you can, take advantage and learn from them. Masanobu Shinjo Goju-ryu would come to Nakasone’s dojo in Kin Village to teach once in a while. He was heavily built was the strongest person I ever trained with in kakie muchimi drills. Often during the drill he would use chinkuchi and stop me dead and I couldn’t move him. He asked me test him by grabbing his testicles but he withdrew them into his body. His sanchin was awesome. What I learned from Masanobu was Sanchin was the way to go if you wanted power (Chinkuchi). Inamine Seijen Ryukyu Shorin-ryu was a student of several Shorin-ryu teachers. One of them was Shimabukuro Eiko the younger brother of Tatsuo. I quit studying from him when he started mixing Aikido into karate kata. I asked him if a certain technique he was teaching was from Aikido and he said yes, but don’t tell the other students. He often came to my home to visit in Kin Village and after seeing all my karate books told Michie, he now understands why I asked a lot of questions. What I learned from Inamine was that some Sensei will pass off Akido, tuite, techniques as traditional karate. If I wanted to learn Aikido I would have gone to a Aikido dojo. Yonamine Kosuke, of Uechi-ryu was outstanding in physical conditioning. I learned Uechi-ryu Sanchin from him and still occasionally practice it. I saw demos where he would stand and hold out his foot with his toes pointing up allowing someone to hit his big toe with a 2X2 breaking it over his toes. I learned Uechi-ryu stylist as a whole are the Okinawans best martial arts fanatics. Of all the karate styles, Uechi-ryu stylist as a rule have the leanest wirily body types. I learned to be a karate fanatic from Yonamine. Iha Kotaro of Ryukyu Kobudo. What I learned was a good tall person can sure look good doing the bo. His son is over six feet tall and is outstanding. Iha looks good but he is small but most of Iha’s students are good and that is the results of a good Sensei. Iha is one of those Sensei who teach with sarcasm. Not everyone can teach that way so I don’t follow that lead. I learned from Iha that high standards make great students. Something like Marines. >From my students who I often learn from by their actions there is good and bad. There will always be those you are proud of and those that you are not proud of. There will be grateful and ungrateful students. Something like the yin and yang. So what I learn from kohai is the good, the bad, the ugly. Life experiences is how we learn, but experience is not the best teacher. The best teacher is learning from someone who teaches things you will use for the rest of your life. As a boy I heard my fathers friends talk about the actions of soldiers and warriors. At age eight I learned how to fight having to defend myself from bullies. My first two instructors were Close Combat Instructors who taught me Combat Judo and Escrima . I also learned the rifle and bayonet and this would be a goal later in life to teach Close Combat to real fighting men. These stories dictated my life and I joined the Marines., went overseas and studied several martial arts styles. Retired from the Marines and opened a dojo and later again taught Marine Hand to hand Combat. Taught a NFL Football team that helped them go to the Super bowl. Helped establish a Marine Corps martial Arts Program. Continue to teach martial arts from my home and teach the teaching of my teachers. While all my lessons were important and guided and directed my life, one of the most important was the lesson from Shimabuku Tatsuo Sensei on teaching karate for health and fitness and always keeping a reserve. As I get older and see friends pass away who are younger then me through preventable illness and disease, then I know that quitting smoking, watching my diet, and training for fitness has paid off possibly adding a few years to my life. It is bad enough that we will without help contract illness so why commit slow suicide smoking or eating junk food (moderation OK). Will we learn by example and reason, and since most that take martial arts as a rule want to learn how to fight, Okinawan martial arts have always emphasized not fighting but correct living. The Kenpo Gokui first and second starts “A person heart (mind) must be in harmony with Heaven and Earth, and the blood pulse is similar to the changing cycle of the sun and moon. The working together of the intangible mind and tangible body. To be in harmony with your fellow human beings and to take care of ones own body through the practice of Okinawan Martial Arts. The importance to those practicing karate who are young and feel invincible and not saving for a rainy day or keeping a fit and healthy body. All I can say, karatedo is not just punching, striking and kicking used for self-defense, it is a way of life. You may have to defend yourself and you may not, but for sure you will have to live and a fitter, healthier life style is better. When the Grim reaper comes, will you have a reserve to take care of your family when you are no longer around. So most important I give credit to all those who came before and who taught me. Even learning what not to do from poor examples is a lesson. Everything I wrote about was important to me. Most important is understanding who is at fault in domestic fights. In 45 years, in all our fights, Michie explained I was at fault in all of them. So the most important thing I have ever learned, and I learned it from Michie, is I am married to the perfect woman.